The hazard of static electricity is more severe in dry, cold weather than in humid weather, when most surfaces are coated with a film of moisture, making them good conductors and draining of static charges. The usual precaution taken to avoid static electricity sparks is grounding or bonding. The terms bonding and grounding should not be used interchangeably because the two processes have distinctly different functions (see below for definitions). Bonding and grounding are effective when applied to conductive bodies. 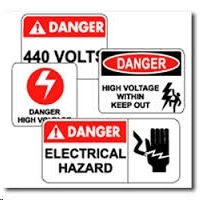 Serious harm can result from electricity with relatively low voltages if a person is not grounded well enough. Entering a vessel with improper lighting equipment or electrical tools can lead to serious injury. Improperly grounded tools or equipment can cause shock. The correct tools, devices and properly trained personnel must be available on site. To discharge potential static build-up from clothing, workers should ground themselves before starting work. Article 100 of the NEC (National Electrical Code) defines grounding as, “Establishing a connection, whether intentional or accidental, between an electrical circuit or equipment and the earth or to some conducting body that serves in place of the earth.” Grounding provides a path for conducting electrical energy to earth to prevent arcing, heating, or explosion during a lightning strike. The NEC defines bonding as, “The permanent joining of metallic parts to form an electrically conductive path that ensures electrical continuity and the capacity to conduct safely any current likely to be imposed.” The primary purpose of bonding is to equalize ground potential of, and eliminate static discharge between, equipment. If a potential difference exists between two objects connected by a conductor, electrons will flow along the conductor from the negatively charged object to the positively charged object, damaging electronics in its path. The flow of electrons happens until the two charged objects are equalized and the potential difference no longer exists. Safety Boss Calgary has moved!